Schenck's "beastness" is starting to rub off onto New Haven's other senior Zach Grater. Last year at Big Driver Grater ran a 19:43 finishing 89th compared to his 33rd place finish on Saturday, running nearly a minute and a half faster. (18:18) More on boys team below. The last time a girls cross country team advanced to state as a team was in 1998 and happened to be Coach John Tucker's first year at New Haven, however this year would be different for Tucker. Pictured in the foreground Lucy Roth and behind her is Hannah Kruse. "In 1998, that team was the result of Kurt Russell's (previous coach) coaching, that was really his team. If our girls perform the way I know they can, they have a real shot at going to state and would really be my first time taking a girls team to state." 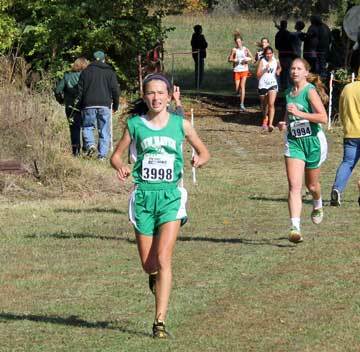 With districts less than two weeks away, New Haven's girls have put themselves in position where placing second at districts is not out of the question. "Were not quite there yet, but if the girls keep improving the way they have, we have a real shot of taking a team to state," Tucker said. Two girls that Tucker has seen the biggest improvement in are the same two who may end up pushing New Haven onto state and both of them are just freshman. "Emily Lewis and Lucy Roth have really come on strong. Being their first year running at the high school level is tough enough; then running at the varsity level with little experience against 100 other girls is not any easier. With every race they gained experience but they also push themselves in practice, wanting to get better." Tucker talks about his boys team. If New Haven has any hopes of placing at districts they are going to need repeat performances from Saturday and a little extra with being in a killer district. Russellville will nearly be impossible to beat with their top five running under 20 minutes they will have a shot at winning a state title. Linn will most likely be the team New Haven will have to knock off to steal a second place finish. 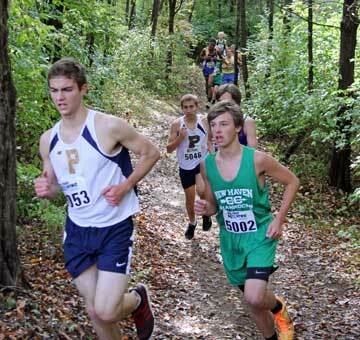 "Cole [Lensing] (Pictured right) ran a 20:02 on that course (Big Driver). He's come such a long ways since his freshman year. By districts I really think he can run under 20 minutes and possibly mid 19's. This would really put pressure on Linn." 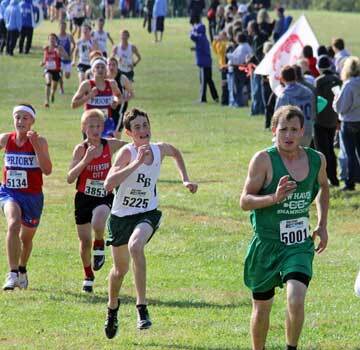 "Sophomore Keven [McDowell] ran under 20 minutes and ran really well. (19:48) And Zach Grater running 18:18, we are making strides in the right direction and overall very pleased with how everyone ran." New Haven finishes their regular season on Tuesday in the Four Rivers Conference Meet at Owensville before Districts on Sat. Nov. 2 at Fatima. Races times for districts have not been announced as of this story. Schedules and brackets can be accessed from the menu bar on the left.